As we stand on the edge of the millennium, looking back at modernity's wake, genocide looms as the Janus face of Western metanarratives of "civilization" and "progress. "1 With the rise of the nation-state and its imperialist and modernizing ambitions, tens of millions of "backward" or "savage" indigenous peoples perished from disease, starvation, slave labor, and outright murder. Sixty million others were also annihilated in the twentieth century, often after nation-states embarked upon lethal projects of social engineering intent upon eliminating certain undesirable and "contaminating" elements of the population. The list of victim groups during this "Century of Genocide"2 is long. Some are well known to the public—Jews, Cambodians, Bosnians, and Rwandan Tutsis. Others have been annihilated in greater obscurity—Hereros, Armenians, Ukrainian peasants, Gypsies, Bengalis, Burundi Hutus, the Aché of Paraguay, Guatemalan Indians, and the Ogoni of Nigeria. Clearly, this devastation poses a critical challenge to scholars: Why does one group of human beings set out to eradicate another group from the face of earth? What are the origins and processes involved in such mass murder? How do we respond to the bodily, material, and psychological devastation it causes? How might we go about predicting or preventing it in the twenty-first century? Because of their experience-near understandings of the communities in which such violence takes place, anthropologists are uniquely positioned to address these questions. Unfortunately, with few exceptions anthropologists have remained remarkably silent on the topic of genocide, as illustrated by the fact that they have written so little on what is often considered the twentieth-century's paradigmatic genocide, the Holocaust.3 Although anthropologists have long been at the forefront of advocating for the rights of indigenous peoples and have conducted rich analyses of violence, conflict, and warfare in substate and prestate societies, they have only recently (since the 1980s) begun to focus their attention intensively on political violence in complex state societies. 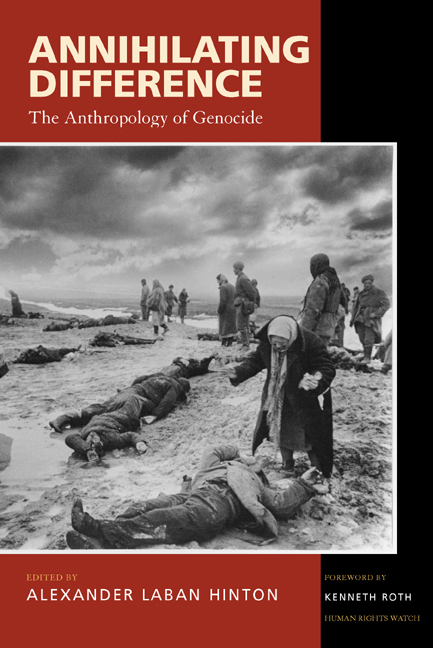 This book represents an attempt to focus anthropological attention directly on the issue of genocide and to envision what an "anthropology of genocide" might look like. To broaden the scope of the volume, the essays examine a variety of cases (ranging from indigenous peoples to the Holocaust) and have been written from a variety of subdisciplinary backgrounds (ranging from archaeology to law). Moreover, the final chapters reflect on the book as a whole and suggest ways in which anthropologists might make a greater contribution to the study of genocide. In the introductory discussion that follows, I frame the essays along two axes. On the one hand, I suggest that genocide is intimately linked to modernity, a concept I define in more detail below. On the other hand, genocide is always a local process and therefore may be analyzed and understood in important ways through the ethnohistorical lens of anthropology. The introduction concludes by suggesting some key issues with which an anthropology of genocide might be concerned. This omission has generated a great deal of debate. As currently defined, the U.N. convention definition has difficulty accounting for such events as the Soviet liquidation of its "enemies" or the Nazi annihilation of tens of thousands of "lives not worth living" (that is, mentally challenged or mentally ill individuals), homosexuals, social "deviants," and communists. Regardless, some genocide scholars prefer to adhere to the strict, legal definition of the Genocide Convention while attempting to account for violence against political and social groups under such alternative rubrics as "related atrocities" (Kuper 1981) or "politicides" (Harff and Gurr 1988). Many other scholars have proposed more moderate definitions of genocide that cover political and social groups but exclude most deaths resulting from military warfare (e.g., Chalk and Jonassohn 1990; Fein 1990). Thus Helen Fein states: "Genocide is sustained purposeful action by a perpetrator to physically destroy a collectivity directly or indirectly, through interdiction of the biological and social reproduction of group members, sustained regardless of the surrender or lack of threat offered by the victim" (Fein 1990:24). Finally, a few scholars use a very broad definition of genocide that covers more types of military warfare (e.g., Charny 1994; Kuper 1994). From an anthropological perspective, the U.N. definition is problematic in several respects. In particular, it gives primacy to an overly restricted set of social categories. While the marking of difference occurs in every society, the social groupings that are constructed vary dramatically. Race, ethnicity, nation, and religion are favored categories in modern discourse. However, as anthropologists and other scholars have demonstrated, many other social classifications exist, including totemistic groups, clans, phratries, lineages, castes, classes, tribes, and categories based on sexual orientation, mental or physical disability, urban or rural origin, and, of course, economic and political groups. Surely, if a government launched a campaign to obliterate the "Untouchables," everyone would characterize its actions as genocide. Likewise, there is no a priori reason why the intentional destruction of a political group or the handicapped should not be characterized as genocidal. The criterion that distinguishes genocide as a conceptual category is the intentional attempt to annihilate a social group that has been marked as different. Some scholars might challenge this assertion by arguing that many of the social categories I have mentioned are too malleable. Such an argument could be refuted in its own terms—it is often extremely difficult to stop being an Untouchable or to stop having a disability. One may much more easily convert to a different religion. Accordingly, I believe it is crucial to note that even categories such as race, ethnicity, and nationality, which are frequently given a primordial tinge, are historically constructed groupings that have shifting edges and fuzzy boundaries. This point is illustrated in Paul Magnarella's essay "Recent Developments in the International Law of Genocide: An Anthropological Perspective on the International Criminal Tribunal for Rwanda." Magnarella provides a detailed overview of the original provisions of the 1948 U.N. Genocide Convention and recent steps toward implementation. Since its inception, the convention has been plagued by the problem of enforcement. Although the convention provides for recourse on the state and international level, crimes of genocide have occurred without intervention or prosecution, since the state itself is usually the perpetrator and will not acknowledge the atrocities taking place within its borders. During the 1990s, the U.N. Security Council used its authority to establish tribunals in the former Yugoslavia and Rwanda. (An anthropologist and a lawyer, Magnarella served as a consultant and researcher for these tribunals.) Moreover, in July 1998, delegates at a U.N. conference in Rome approved a statute calling for the creation of a permanent International Criminal Court, despite the protests of the United States and a handful of other countries, including Iran, Iraq, China, Lybia, Algeria, and Sudan. President Clinton finally signed the treaty in January 2001, days before leaving office. Senate confirmation remains in doubt. After tracing these developments, Magnarella describes the process by which the International Criminal Tribunal for Rwanda (ICTR) conducted the first trial for the crime of genocide ever held before an international court. In September 1998, fifty years after the adoption of the U.N. convention, former Rwandan mayor and educator Jean—Paul Akayesu was convicted of various acts of genocide, as well as crimes against humanity. Magnarella recounts the testimony of one woman who, despite seeking Akayesu's protection, was repeatedly raped in public; Akayesu reportedly encouraged one of the rapists, saying: "Don't tell me that you won't have tasted a Tutsi woman. Take advantage of it, because they'll be killed tomorrow." Akayesu, in turn, claimed that he was a minor official who was unable to control the atrocities that took place in his municipality. Because of its unprecedented work, the ICTR faced many difficulties in achieving the conviction of Akayesu. One of the foremost problems was the U.N. convention's lack of a definition of a "national, ethnical, racial or religious group." Background research revealed that the drafters of the convention restricted the definition of the term genocide to "stable, permanent groups, whose membership is determined by birth." Based on that conceptual distinction, the ICTR came up with provisional definitions of the aforementioned groups. However, the more fluid Hutu/Tutsi/Twa distinction did not clearly fit any of the proposed definitions. Noting that Rwandans readily identified themselves in these terms and that the labels were used in official Rwandan documents, the ICTR nevertheless concluded that such emic distinctions could serve as a basis for prosecution. Magnarella points out that the ICTR effectively expanded the coverage of the convention by adding any "stable and permanent group, whose membership is largely determined by birth" to the pre-existing national, ethnic, racial, and religious categories. Thus, atrocities committed against those of different castes, sexual orientations, or disabilities might qualify as genocidal. In addition, the ICTR set a precedent for examining local understandings of social difference, since etic ones are too often indeterminate and vague. In fact, as I will later point out, this very uncertainty about identity often leads perpetrators to inscribe difference upon the bodies of their victims (Appadurai 1998; Feldman 1991; Taylor 1999). Although the ICTR ultimately maintained a criterion of enduring difference, its difficulty in using "national, ethnical, racial or religious" designations illustrates that even these seemingly stable categories refer to sets of social relations that have fuzzy boundaries and vary across time and place (see also Bowen, this volume). Accordingly, I would advocate the use of a more moderate definition of genocide, such as the one Fein proposes, because it can, without losing analytic specificity, more easily account for the fact that group boundaries are socially constructed across contexts and through time. From an anthropological perspective, the reification of concepts such as race and ethnicity (while not surprising, given the historical privileging of perceived biological difference in much Western discourse) is problematic because—like class, caste, political or sexual orientation, and physical and mental disability—the terms reference "imagined communities," to borrow Benedict Anderson's (1991) term. Genocides are distinguished by a process of "othering" in which the boundaries of an imagined community are reshaped in such a manner that a previously "included" group (albeit often included only tangentially) is ideologically recast (almost always in dehumanizing rhetoric) as being outside the community, as a threatening and dangerous "other"—whether racial, political, ethnic, religious, economic, and so on—that must be annihilated. Before turning to describe some of the other themes and essays in this volume, I would like to briefly discuss how genocide might be distinguished from other forms of violence. The English word violence is derived from the Latin violentia, which refers to "vehemence, impetuosity, ferocity" and is associated with "force. "9 In its current usage, violence may refer specifically to the "exercise of physical force so as to inflict injury on, or cause damage to, persons or property" (Oxford English Dictionary 1989:654), or quite generally to any type of physical, symbolic, psychological, or structural force exerted against someone, some group, or some thing.10 Political violence is a subset of violence broadly encompassing forms of covert or, as Carole Nagengast has stated, "overt state-sponsored or tolerated violence" that may include "actions taken or not taken by the state or its agents with the express intent of realizing certain social, ethnic, economic, and political goals in the realm of public affairs, especially affairs of the state or even of social life in general" (1994:114). Political violence, in turn, subsumes a number of potentially overlapping phenomena including terrorism, ethnic conflict, torture, oppression, war, and genocide. What distinguishes genocide from these other forms of political violence is the perpetrators' sustained and purposeful attempt to destroy a collectivity (Fein 1990:24). Thus, while genocide may involve terrorism (or acts intended to intimidate or subjugate others by the fear they inspire), ethnic conflict (or violence perpetrated against another ethnic group), torture (or the infliction of severe physical pain and psychological anguish to punish or coerce others), oppression (or the use of authority to forcibly subjugate others), and war (or a state of armed conflict between two or more nations, states, or factions), it differs from them conceptually insofar as genocide is characterized by the intention to annihilate "the other. "11 Clearly, the boundaries between these different forms of political violence blend into one another. Moreover, as with all conceptual categories, genocide is based on certain presuppositions that are subject to debate and challenge. Nevertheless, I believe that we may legitimately delineate the domain of "an anthropology of genocide" as encompassing those cases in which a perpetrator group attempts, intentionally and over a sustained period of time, to annihilate another social or political community from the face of the earth. [As] you are aware, in undertakings like ours the capital is applied to and spent in conquering or more properly attracting to work and civilization the savage tribes, which, once this is attained . . . brings to us the property of the very soil they dominated, paying afterwards with the produce they supply, the value of any such advance. In undertakings like ours any amounts so applied are considered capital. But humbled be, and thou shalt see these Indians soon will dy. Yea Rats and Mice, or Swarms of Lice a Nation may destroy. If the concept of genocide is a twentieth-century invention, the types of destructive behaviors it references go far back in history. Many of the earliest recorded episodes were linked to warfare and the desire of the perpetrators to either eliminate an enemy or terrify potential foes into submission, what Helen Fein (1984) has called "despotic genocides. "14 The ancient Assyrians, for example, attempted to rule by fear, repeatedly massacring or enslaving those peoples who failed to submit to their authority. Seenacherib's destruction of Babylon in 689 b.c. provides one illustration: "[He] made up his mind to erase rebellious Babylon from the face of the earth. Having forced his way into the city, he slaughtered the inhabitants one by one, until the dead clogged the streets. . . . He would have the city vanish . . . from the very sight of mankind" (Ceram 1951:269). Ironically, the Assyrians themselves were later annihilated at the end of a war. Similarly, the Athenian empire made a terrifying example of upstart Melos by killing all Melinian men of military age and selling their women and children into slavery. The Mongols of Genghis Khan, in turn, developed a ferocious reputation for the massacres they carried out. Mongol soldiers were sometimes ordered to prove they had killed a requisite number of people by cutting off their victims' ears, which were later counted. With the advent of modernity, however, genocidal violence began to be motivated by a new constellation of factors. The term modernity is notoriously difficult to define and can perhaps best be described as a set of interrelated processes, some of which began to develop as early as the fifteenth century, characterizing the emergence of "modern society. "15 Politically, modernity involves the rise of secular forms of government, symbolized by the French Revolution and culminating in the modern nation-states. Economically, modernity refers to capitalist expansion and its derivatives—monetarized exchange, the accumulation of capital, extensive private property, the search for new markets, commodification, and industrialization. Socially, modernity entails the replacement of "traditional" loyalties (to lord, master, priest, king, patriarch, kin, and local community) with "modern" ones (to secular authority, leader, "humanity," class, gender, race, and ethnicity). Culturally, modernity encompasses the movement from a predominantly religious to an emphatically secular and materialist worldview characterized by new ways of thinking about and understanding human behavior. In many ways, this modern worldview was epitomized by Enlightenment thought, with its emphasis on the individual, empiricism, secularism, rationality, progress, and the enormous potential of science. For Enlightenment thinkers and their heirs, the social world, like nature, was something to be analyzed and explained in a rational, scientific manner. Ultimately, such empirical research would yield universal laws of human behavior and provide knowledge that could be used to advance the human condition. This optimistic bundle of ideas contributed greatly to the emergence of a key metanarrative of modernity—the teleological myth of "progress" and "civilization. "16 On the one hand, the human condition was portrayed as involving the inexorable march of progress from a state of savagery to one of civilization. On the other hand, reason and science provided the means to facilitate this march through social engineering; human societies, like nature, could be mastered, reconstructed, and improved. David Maybury-Lewis's essay, "Genocide against Indigenous Peoples," notes that, while we will never know the exact numbers, somewhere between thirty and fifty million (or more) indigenous people—roughly 80 percent—perished from the time of first contact to their population low points in the late nineteenth and early twentieth centuries (see also Bodley 1999). Because of the technological and military superiority of European imperialists, various indigenous peoples stood little chance of resisting their advance and exploitative policies, particularly when coupled with the devastating effects of disease. As Maybury-Lewis points out, not all of the devastation was caused by genocide. Indigenous peoples perished from European diseases to which they had no resistance, from forced labor, from starvation caused by their loss of land and the disruption of their traditional ways of life, and from outright murder. Some of the deaths were intentionally perpetrated; others were caused indirectly. Maybury-Lewis describes how the inhumane and genocidal treatment of indigenous peoples was often framed in metanarratives of modernity, particularly the notion of "progress." Thus, the annihilation of Tasmanians was legitimated as an attempt to "bring them to civilization," and Theodore Roosevelt justified the westward expansion of the United States by arguing that the land should not remain "a game preserve for squalid savages." Likewise, General Roca, who led the infamous "Conquest of the Desert" against indigenous Indians, told his fellow Argentineans that "our self—respect as a virile people obliges us to put down as soon as possible, by reason or by force, this handful of savages who destroy our wealth and prevent us from definitively occupying, in the name of law, progress and our own security, the richest and most fertile lands of the Republic" (Maybury-Lewis, this volume). Similar arguments were made to legitimate the massacre of thousands of Herero. As Maybury-Lewis highlights, the perpetrator's greed and cruelty is astounding and, often, sickening. In the above examples, indigenous peoples were displaced and killed for their land. In other instances, they were terrorized into performing slave labor. Rubber—plantation owners in South America and the Congo were particularly brutal; they held relatives of the workers as hostages, raped women, tortured and maimed the recalcitrant, and sometimes abused and killed simply for amusement (see also Taussig 1987). In more recent times, indigenous peoples have been devastated by another metanarrative of modernity—discourses asserting the need for "development." The "development" of Nigeria's oil resources (through the collaboration of the government and multinational companies such as Shell), for example, has led to massive environmental damage and the enormous suffering of the Ogoni who reside in oil-rich areas (see also Totten, Parsons, and Hitchcock, this volume). In his own work at Cultural Survival, Maybury-Lewis continues to inform the public about the suffering of indigenous peoples around the globe, including contemporary cases in which states have waged war against indigenous peoples within their borders who have resisted—or been perceived as resisting—the state's authority (for example, the Naga of India, various non-Burmese peoples, Guatemalan Indians, and Sudanese Christians). Maybury-Lewis's chapter concludes by summarizing some of the factors that have contributed to the genocide of indigenous peoples—the resources of the land upon which they live, extreme dehumanization, marginality and political weakness, and metanarratives of modernity. Perhaps, he suggests, the plight of indigenous peoples will improve in an era of globalization as nation-states are increasingly reorganized along more pluralist lines. If Maybury Lewis's essay outlines the long history of genocidal atrocities committed against indigenous peoples throughout the world, Samuel Totten, William Parsons, and Robert Hitchcock's chapter, "Confronting Genocide and Ethnocide of Indigenous Peoples: An Interdisciplinary Approach to Definition, Intervention, Prevention, and Advocacy," constitutes an interdisciplinary effort to clarify key issues related to the prevention of such atrocities. As cultural, applied, forensic, and other anthropologists have taken an increasingly proactive role in defending indigenous peoples, they have found themselves working with scholars from other fields, policy-makers, and indigenous peoples themselves. Unfortunately, the participants in such collaborative efforts often use terms like genocide in very different ways. Prevention, intervention, and advocacy, the authors argue, require precise conceptual distinctions that may lead to disparate preventative strategies. The very definition of the term indigenous people is problematic, since in many places groups may migrate and identify themselves in different ways. Totten, Parsons, and Hitchcock note that the Independent Commission on International Humanitarian Issues identifies four key characteristics of indigenous peoples—pre-existence, nondominance, cultural difference, and self-identification as indigenous—which parallel Maybury-Lewis's definition of indigenous peoples as those who "have been conquered by invaders who are racially, ethnically, or culturally different from themselves." Crucial issues revolve around the question of how one defines indigenous peoples. Several African and Asian governments, for example, have tried to deny that indigenous peoples live within their borders or argue that all the groups in the country are indigenous. By doing so, they attempt to avoid international inquiries on the behalf of indigenous peoples and undercut their claims for compensation or lands rights. Totten, Parsons, and Hitchcock also make useful distinctions between physical genocide (that is, the intentional killing of the members of a group), cultural genocide or "ethnocide" (the deliberate destruction of a group's way of life), "ecocide" (the destruction of a group's ecosystem by state or corporate entities), and various typologies of genocide (such as retributive, despotic, developmental, and ideological).18 With such conceptual distinctions in mind, anthropologists and other advocates may more effectively promote the rights of indigenous peoples by developing explicit standards to monitor and defend groups at risk. In addition, scholars and policy-makers may work to develop early-warning systems that trigger an alarm when the possibility of genocide is high in a locale. By using their "on the ground experience" to help warn about impending genocides and by helping to develop educational initiatives, anthropologists may play a crucial role in such efforts at prevention, intervention, and advocacy. Such efforts, Totten, Parsons, and Hitchcock argue, are of crucial importance since indigenous peoples continue to endure a wide range of abuses, ranging from involuntary relocation and the forcible removal of children to arbitrary executions and genocide. Like Maybury-Lewis's essay, their chapter illustrates how such devastation is often implicitly or explicitly legitimated by metanarratives of modernity. Governments, agencies, companies, and multinational corporations frequently portray the suffering and death of indigenous peoples as a "necessary by-product" of "development" and "progress," which come in the form of logging, mineral extraction, hydroelectric projects, oil fields, and land grabs in resource-rich areas. Totten, Parsons, and Hitchcock carefully document how such projects result in enormous environmental damage, displacement, and, all too often, the deaths of indigenous peoples such as the Ogoni. Ultimately, the very need for such harmful "development" projects is linked to other dimensions of modernity, the colonial endeavor and the creation of nation-states. As European imperialists set out to conquer new territories, they laid claim to large swaths of land throughout the world. Colonial boundaries were "rationally" demarcated in terms of major landmarks and the claims of competing powers. This pattern of "rational planning," establishing territorial borders, and ordering from above is one of the hallmarks of modernity. In order to create a map or grid that can be centrally controlled and manipulated, the modern state reduces and simplifies complex phenomena into a more manageable, schematized form; unfortunately, the results are often disastrous, particularly when local knowledge is ignored (Scott 1998). Colonial powers usually paid little attention to local understandings of sociopolitical difference when mapping out new political boundaries. After the colonial powers withdrew, newly independent nations found themselves in control of minority (and sometimes even majority) populations—including indigenous peoples—that wanted greater autonomy, more power, or the right to secede outright. Moreover, because of the exploitative economic practices of the colonial powers, many nations lacked basic infrastructure and trained personnel and were plagued by poverty and high rates of population growth. Colonialism therefore laid the foundation for much of the violent conflict and suffering that has plagued the twentieth-century world, as recently exemplified by the genocidal events in Rwanda. Modern genocide is genocide with a purpose. . . . It is a means to an end. . . . The end itself is a grand vision of a better, and radically different, society. . . . This is the gardener's vision, projected upon a world-size screen. . . . Some gardeners hate the weeds that spoil their design—that ugliness in the midst of beauty, litter in the midst of serene order. Some others are quite unemotional about them: just a problem to be solved, an extra job to be done. Not that it makes a difference to the weeds; both gardeners exterminate them. If all human beings are born with a propensity to distinguish difference, modern societies are distinguished by the degree to which such differences are reified. In other words, modernity thrives on the essentialization of difference. Several factors have contributed to this tendency. First, during the Age of Expansion, European explorers found themselves confronted with groups of people whose appearance and ways of life differed dramatically from their own. To comprehend such difference and to justify their imperialist, exploitative enterprises, Europeans frequently constructed the wide array of peoples they encountered in a similar fashion—as "primitive" others who lived in a degenerate and lawless state. As noted in the last section, these "others" served as an inverted mirror of modernity, giving rise to the type of "Orientalist" constructions that Edward Said (1985) has so vividly described. The west (us) was frequently opposed to "the rest" (them) in a unidimensional, stereotypic, and essentialized manner. Second, the modern nation-states covets homogeneity. In contrast to earlier state formations, the nation-states is characterized by fixed territorial borders, centralized control of power, impersonal forms of governance, and a representational claim to legitimacy (see Held 1995). The very existence of the nation-states is predicated upon the assumption that there is a political "imagined community" of theoretically uniform "citizens" who, despite living in distant locales and disparate social positions, read the same newspapers and share a similar set of interests, legal rights, and obligations (Anderson 1991). It is in the nation-states's interest to use whatever means are at its disposal—national holidays, the media, institutional policy, flags, and anthems—to promote this vision of homogeneity. This tendency frequently culminates in a naturalized identification between person and place, often expressed in origin myths and arborescent metaphors that physically "root" nationals to their homeland and assert the identification of blood, soil, and nation (see Malkki 1997; Linke, this volume). Third, science searches for regularity. This quest is exemplified by its theoretical laws, quantitative measures, methodologies, empiricism, and classificatory systems. Enlightenment thinkers extended the emerging scientific mentality to human beings, who, the colonial encounter revealed, seemed to come in a variety of shapes, colors, and sizes. People, like other species and the physical world itself, had a "nature" that could be apprehended, classified, and theorized. Ultimately, this analogy had a lethal potentiality, which was actualized when hierarchical typologies of human difference were reified in terms of biological origins. "Otherness" became an immutable fact. Science thereby provided a legitimizing rationale for slavery, exploitation, and, ultimately, genocide in the modern era. And, finally, to have "progress," one must have places and peoples to which it may be brought (savage "others" living in a "backward" state) and a standard (the end-point or goal) against which it may be judged (the "advanced" state of "civilization"). The means of "progress" is exemplified by modernity's projects of social engineering (Bauman 1991; Scott 1998). "Development" requires rational design (and, of course, the centralized control of the modern nation-states); rational design, in turn, requires legible, precise units that can be manipulated from above. From the perspective of the social engineer, groups of people are conceptualized as homogenous units having specifiable characteristics, which, like scientific variables, can be manipulated to achieve the desired end. As Zygmunt Bauman (1991) has so effectively demonstrated, these essentializing impulses of modernity contributed to the paradigmatic genocide of the twentieth century, the Holocaust. In their attempt to create a homogenous German "folk community," the Nazis embarked on a lethal project of social engineering that was to eliminate "impure" groups that threatened the Aryan race. Difference was biologized into an immutable physiological essence that could not be changed. More than 200,000 severely disabled or mentally ill people, classified by German physicians as "lives not worth living," were murdered in the name of eugenics and euthanasia. Similarly, the Nazis executed up to six million Jews who were ideologically portrayed as a "disease," as "bacilli," and as "parasites" that threatened to poison the German national body and contaminate the purity of German blood (Koenigsberg 1975; Linke 1999). Gypsies and other undesirable groups were also targeted for elimination. Once difference was essentialized and sorted into categories, the Nazis employed modern instruments to carry out their genocidal acts—state authority (the Nazi's centralized powers and control over the means of force), bureaucratic efficiency (managerial expertise regulating the flow of victims and the means of their annihilation), a technology of death (concentration camps, cyanide, railroad transport, crematoriums, brutal scientific experiments), and, of course, rational design (the Nazi's abstract plan for a "better" world). The Nazi genocide represented the culmination of modernity's lethal potentiality, as the German state, like Bauman's gardener, set out to reshape the social landscape by systematically and efficiently destroying the human weeds (Jews, Gypsies, "lives not worth living") that threatened to ruin this rational garden of Aryan purity. As Bettina Arnold's and Gretchen Schafft's chapters suggest, anthropology, like other academic disciplines, was deeply implicated in this genocidal project of modernity and its essentializing tendencies. In fact, the rise of anthropology as a discipline was linked to the colonial encounter as Euroamerican missionaries, officials, travelers, and scholars attempted to comprehend the strange "others" they encountered. In other words, anthropology arose as one of modernity's disciplines of difference. Working from the Enlightenment belief in "progress" and the possibility of discovering scientific laws about human societies, anthropology's early progenitors, such as Spencer and Morgan, proposed that human societies advance through increasingly complex stages of development—from "savagery" to "barbarism" to modernity's apex of human existence, "civilization." Diverse ways of life were compressed into relatively stable categories, a homogenizing tendency that was paralleled by the anthropological typologies of race. If later anthropologists moved toward a more pluralistic conception of cultural diversity (via Herder and Boas), the discipline nevertheless continued to employ a concept of culture that was frequently reified and linked to the fixed territorial boundaries upon which the modern nation-states was predicated. In Germany, all of these essentializing tendencies coalesced under the Nazis, who asserted an equation between German blood and soil and the superiority of the German folk community. As experts on human diversity, German anthropologists were quickly enlisted to help construct this genocidal ideology of historical and physical difference, a process I have elsewhere called "manufacturing difference" (Hinton 1998, 2000). Bettina Arnold's essay, "Justifying Genocide: Archaeology and the Construction of Difference," illustrates how historical difference is manufactured with archaeological "evidence" that provides an imagined identification between people and place. Such national identifications are notoriously susceptible to ideological manipulation because the categories upon which they are predicated—race, nation, ethnicity, religion, language, culture—are fuzzy and may shift across time, place, and person. Almost anyone can find an imagined origin for "their" group if they look hard enough, as recently illustrated by the violent conflict in the former Yugoslavia. German National Socialism proved adept at such historical imaginings, which attempted to construct a mythic linkage between the Germanic people and their homeland. Arnold illustrates how German archaeologists, such as Gustaf Kossinna, reconstructed the past to provide a "pure," continuous line of Germanic cultural development from their ethnoparthenogenetic origin in the Paleolithic period up to the "post-Germanic" phase. Since the German people were supposed to be the most advanced race ever to have inhabited the earth, the Nazis sought to construct an archaeological record that demonstrated that the major advances in European history were of Nordic origin and denied that the Germanic people had been influenced by those of a "lesser" racial stock. Thus, through the creation of a mythic north-south migration route, the great achievements of ancient Greece and Rome were given a Germanic origin. Migration theory could also provide a basis for Nazi expansionist claims that the regime was merely retaking lands that had historically been Germanic territories. Ultimately, by constructing origin myths for the German nation-states and the superiority of the Aryan race, German archaeologists helped create essentialized categories of difference that served as an underpinning and justification for genocide. Arnold notes that archaeology has also been used to legitimate genocide in other contexts. In the United States, for example, European settlers were sometimes dramatically confronted with the complex cultural achievements of Native Americans, such as the earthen mounds discovered in Ohio and the Mississippi River Valley. According to models of evolutionary progress, the "savage" natives could not possibly have built such sophisticated structures. To deal with this paradox, nineteenth-century archaeologists proposed the "Moundbuilder Myth," which held that the mounds had been built by a vanished race. By reconstructing the past to agree with their metanarratives of modernity, the European colonizers were able to legitimate their continued destruction of Native American societies, whose very "savagery" was confirmed by their suspected annihilation of the "civilized" Moundbuilders. The archaeological record was used in similar ways in Africa and other colonial territories. Arnold concludes by pointing out that archaeological evidence continues to be manipulated by various peoples around the globe—Chinese, Japanese, Celts, Estonians, Russians, Israelis—to legitimate their nationalist claims. By carefully examining and monitoring the ways in which archaeology continues to be used to manufacture difference, she suggests, anthropologists stand to make an important contribution to the prevention of genocide. Although Arnold does not discuss Rwanda and the former Yugoslavia, her arguments about the lethal potentialities implicit in the association between people and place could certainly be applied to these genocides. In both cases, origin myths served as a basis for essentializing difference and legitimating the annihilation of victims. In colonial Rwanda, German and later Belgian officials reimagined social differences in terms of the "Hamitic Hypothesis," which held that Tutsis were more "civilized" Hamites who had migrated south from Egypt and the Nile Valley and introduced more "advanced" forms of "development" into the region (see Taylor 1999, and this volume; see also Malkki 1995). Tutsis therefore shared racial characteristics that enabled them to be more effective leaders than the allegedly racially inferior Hutus, who were supposedly of Bantu stock. In the postcolonial period, this origin myth was reinvented by Hutus to argue that the Tutsis were "tricky," impure foreign invaders who had to be expunged from what was Hutu soil—an image reminiscent of Nazi discourse about Jews. Similarly, in Bosnia-Herzegovina in the 1990s, Serb and Croat historiographers vied to construct historical linkages connecting themselves to Muslims ("converts" and "heretics") and the territories in which they lived; Muslim scholars, in turn, argued that they were a national group (narod) that shared a way of life, religious beliefs, and legacy of residence on their lands (Bringa 1995, and this volume). Political ideologues played upon these different vantage points, arguing that their group had the right to lands that "others" now occupied. Genocide and ethnic cleansing were used to reconstruct an equivalence between national group and soil. As in Nazi Germany, in Rwanda and Bosnia an origin myth was ideologically deployed to essentialize identity, creating an "us" that belonged and a "them" that needed to be expunged—by forced removal or by death. Gretchen Schafft's essay, "Scientific Racism in Service of the Reich: German Anthropologists in the Nazi Era," illustrates how Nazi anthropologists were deeply implicated in another form of manufacturing difference—constructing the alleged "characteristics" of various social groups. Many of these anthropologists worked in the anthropology division of the Kaiser Wilhelm Institute (KWI), which received large grants from the Rockefeller Foundation to conduct its studies on race and genetics. (This funding continued long after Hitler had begun to impose his anti-Semitic policies.) Schafft notes that, during the course of the 1930s, the anthropologists at the KWI's Institute for Anthropology, Human Heredity, and Genetics became increasingly involved in the racial politics of the Third Reich. On a practical level, these anthropologists acted as judges of identity and, therefore, had a considerable impact on an individual's chances for survival in Nazi Germany. Some certified racial backgrounds by examining an individual's blood type and physical features; others served as members of Nazi Racial Courts that enforced racial policy and heard appeals, though these were rarely granted. On a theoretical level, German and Austrian anthropologists helped buttress Nazi ideology by publishing articles on race and by training hundreds of SS doctors in the theory and practice of racial hygiene. In fact, one anthropologist, Otmar von Verscheur, founded Der Erbartz, a leading medical journal that frequently published articles supporting Nazi policy on eugenics and race. Schafft illustrates how, after World War II broke out, many Nazi anthropologists became even more intimately involved in the atrocities perpetrated during the Holocaust. Verschuer, who replaced the retiring Eugon Fischer as head of the KWI's Anthropology Institute in 1942, acted as a mentor to Josef Mengele, who himself had degrees in anthropology and medicine. Their collaboration continued while Mengele performed his notorious experiments at Auschwitz; in fact, Mengele sent blood samples and body parts to the Anthropology Institute for further analysis. After Germany invaded Poland, a number of anthropologists began working at the Institute für Deutsche Ostarbeit (Institute for Work in the East, or IDO) in the Race and Ethnic Research section. Some of these Nazi anthropologists were given responsibility for examining ethnic and racial differences in the newly conquered Eastern European territories. They conducted ethnographic research in a variety of locales, ranging from Polish villages to delousing centers and concentration camps. In many situations, SS guards provided these anthropologists with protection and forced their subjects, sometimes at gunpoint, to be examined, measured, and interviewed. Other anthropologists at the IDO examined the effects of "racial mixing" and identified various "racial strains." Like their colleagues at the KWI, Nazi anthropologists at the IDO were ultimately in the business of manufacturing difference—sorting diverse peoples into a fabricated hierarchy of essentialized biosocial types. The work of all of these Nazi anthropologists contributed directly to genocide, since they identified and judged the racial background of various individuals, forcibly used helpless victims (or their body parts) in their research projects, and, ultimately, provided a theoretical foundation for euthanasia, "racial hygiene," and the annihilation of Jews and other "impure" racial groups. Schafft further considers why Nazi anthropologists participated in genocide. She suggests that anthropologists like Eugon Fischer, who altered his views about the benefits of "racial mixing" after Hitler took power, were driven, in part, by the desire for advancement and to continue conducting scientific research. (Those who protested in the Third Reich quickly lost their positions or were arrested.) Other Nazi anthropologists might have wanted to avoid military service. Many of these individuals may have believed that the lethal racist policies of the Third Reich were backed by scientific research. Still, the fact that these Nazi anthropologists often used vague and euphemistic language suggests that, on some level, they may have experienced qualms about what they were doing.20 This vagueness subsequently enabled many Nazi anthropologists to escape punishment and continue their careers after the war, sometimes in positions of prominence. Finally, Schafft asks why anthropologists have been so hesitant to explore this dark chapter of their disciplinary history. Perhaps anthropologists don't want to draw further attention to the fact that their participation in public projects has sometimes been ethically suspect and had disastrous results. Others might reply that the Nazi anthropologists were a small fringe group whose work fell outside the mainstream of anthropological thought. Schafft responds by noting that anthropologists throughout the world were using many of the same conceptual categories as Nazi anthropologists, including notions of race, eugenics, and social engineering. Ultimately, I suspect that the Holocaust is difficult for us to look at because it illustrates how our most fundamental enterprise—examining and characterizing human similarity and difference—may serve as the basis for horrendous deeds, including genocide. Genocidal regimes thrive on the very types of social categories that anthropologists analyze and deploy—peoples, cultures, ethnic groups, nations, religious groups. Anthropology is, in large part, a product of modernity and its essentializing tendencies. However, our discipline has another side, tolerance, which also has its roots in Enlightenment thought and was forcefully expressed by some of the founding figures of anthropology, such as Johann Herder and Franz Boas. Following this other disciplinary tradition, anthropologists have fought against racism and hate, defending the rights of indigenous peoples, demonstrating that categories like race are social constructs situated in particular historical and social contexts, and advocating a general respect for difference. These insights can certainly be extended to combat discourses of genocide. Nevertheless, an understanding of Nazi anthropology may help us to acknowledge and remain aware of our discipline's reductive propensities and the ways in which the forms of knowledge we produce can have powerful effects when put into practice. Although I have frequently referred to modernity in the singular, I want to emphasize that modernity is not a "thing." The term refers to a number of interrelated processes that give rise to distinct local formations, or "modernities." If genocide has frequently been motivated by and legitimated in terms of metanarratives of modernity, genocide, like modernity itself, is always a local process and cannot be fully comprehended without an experience-near understanding. Thus, modernity and genocide both involve the essentialization of difference, but the ways in which such differences are constructed, manufactured, and viewed may vary considerably across time and place. Moreover, the form and experience of genocidal violence is variably mediated by local knowledge. Genocide is one of the most pressing issues that confronts us today. Its death toll is staggering: over one hundred million dead. Because of their intimate experience in the communities where genocide takes place, anthropologists are uniquely positioned to explain how and why this mass annihilation occurs and the types of devastation genocide causes. This ground breaking book, the first collection of original essays on genocide to be published in anthropology, explores a wide range of cases, including Nazi Germany, Cambodia, Guatemala, Rwanda, and Bosnia. Alexander Laban Hinton is Associate Professor of Anthropology at Rutgers University. He is editor of Biocultural Approaches to the Emotions (1999) and Genocide: An Anthropological Reader (2001).